By 1998, Star Trek: The Next Generation was off TV and could only be seen with big screen installments. This meant that the pressure would be on for the movies to bring excitement, scale and a spectacle worthy of the big screen experience. Unfortunately, Insurrection doesn’t quite deliver. It isn’t that Insurrection is a bad film, far from it, it is just that it doesn’t feel “special.” It could well slot neatly into any of the TV show’s seven seasons. It would be larger-scale episode, but wouldn’t feel too out of place or extraordinary. This is a shame because it starts with an intriguing concept. The idea of a civilization who has rejected technology, Brent Spiner’s Data attacking his own Starfleet and then the Enterprise crew rebelling against the Federation itself are all plot points ripe with possibility and potential. There are moments when they take advantage of this too, from Data learning how to be a child from a new, younger friend, a unique species of alien who are obsessed with being young and some actual progression in the love story between Jonathan Frakes’ Riker and Marina Sirtis’ Troi. There is even a great vein of humour running through the film. Scenes where people seem to be getting younger or permanent medical afflictions miraculously heal make for some great plot points, particularly because they are happening to a cast who many have grown very fond of from their TV series adventures. It is just a shame that nothing really revolutionary is done with all this ripe material. There is a decent if somewhat underwhelming villain, a poor attempt at a love story for Patrick Stewart’s Picard and a third act reveal which makes some sense but doesn’t deliver on it’s promise. The movie is never boring. There are some great action sequences but nothing new. Fire-fights with drones, deep-space ship battles and the usual explosive finale are all present, correct and after ten Star Trek movies, generic. 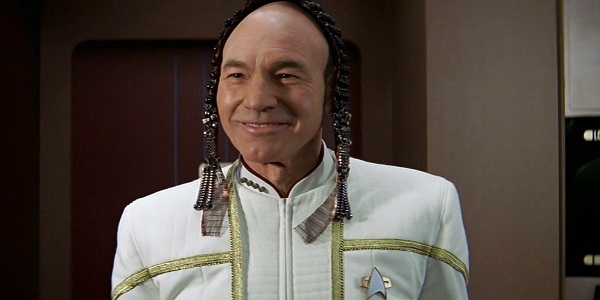 Overall, Star Trek: Insurrection has some good ideas, a plot full of potential and a very good attempt to deliver something new but never manages to step-up from generic. It is watchable, has some very funny moments and it is always good to see The Next Generation crew in a new adventure but it should be one that amazes and entertains rather than a story which could have been done on the small-screen to the same effect. I was there, and i knew what was happening to Star Trek. The creative well was running dry, so the TV writers looked at the shoulders of their TV competitor “BABYLON 5” for ideas. “Babylon 5” was a TV series from Warner, featuring a space station crowded with alien races and it was run by Earth´s military. As soon as “Babylon 5” storyarchs began to develop, MANY ideas, punchlines, tricks, etc, were also appearing in “Star Trek Voyager” and “Deep Space Nine”. “Star Trek First Contact” line “If you were any other man i would kill you were you stand” was a line from Ambassador G´Kar to Commander Sinclair in season 1. “Deep Space Nine”´s Sisko line “Then its our LAST BEST HOPE” its from “Babylon 5´s” season 3 intro. “Star Trek Voyager” “YEAR OF HELL” it was stolen from “Babylon 5″´s YEAR OF FIRE line in season 4 intro. And an inssurection against the boss was stolen from “Babylon 5” season 3 when they had to fight an evil president who was bombing Mars colonies. That is some good insider knowledge. I’ve never seen any Babylon 5 or the other Star Trek series which followed The Next Generation. Sounds like there is a blog article in there though. I strongly recommend a “Babylon 5” marathon, it was a pioneer in many things, like CGI ships instead of TV budget miniature models. It has always been on my radar. Maybe if it gets on Netflix I can give it a look. 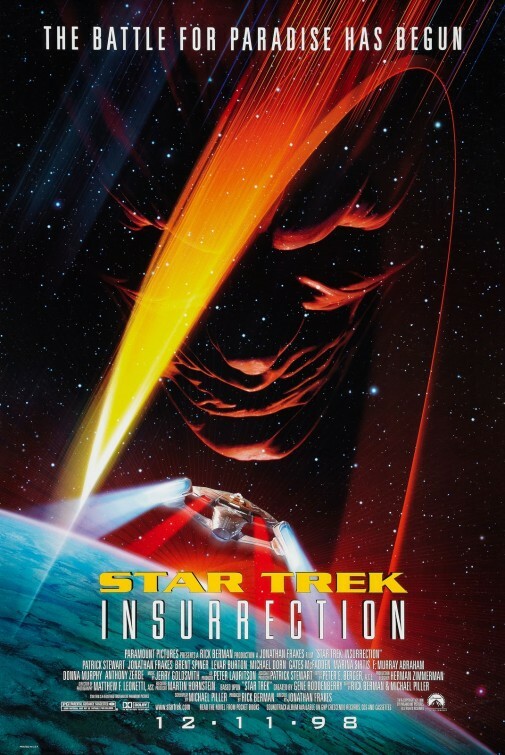 Insurrection is one of my favorite Star Trek: TNG films because of the gorgeous score that Jerry Goldsmith created, it’s tonally the complete opposite of the previous score for First Contact (which is not a bad thing).